Posted on Sun, Feb 12, 2012 : 5:58 a.m.
Forsythe Middle School parent Tam Perry looks over a science fair submission in the school gym on Friday afternoon. Displays were to be judged on Saturday and the fair will be open to the public on Sunday. If you visit Forsythe Middle School in Ann Arbor Sunday afternoon, you'll have the chance to see more than 300 projects on display as part of this year's school science fair. That's enough to make it among the biggest - if not the biggest - science fairs in the state. It is a requirement for all sixth-graders and optional for seventh and eighth-graders. "No, time actually goes slower," said Michael. "I asked my subjects to do fun things like socializing, watching TV and playing video games, and they guessed that more time had gone by than actually had gone by." "I used a sprinkler and moved sponges around the sprinkler to represent people," said Lia. "Then I squeezed the water out of the sponges and measured it and found you get the most wet standing still." Isak Poulsen, also a sixth-grader at Forsythe, did a study on the difference between the mold on bread with chemical preservatives and bread without them. His mom, Lea Monaghan, who helped organize this year's science fair, has enjoyed watching her son at work. "It was a good learning experience for him to see the effects of an experiment that you don't plan on," she said. "It surprised me to learn that dry bread left out lasts a really long time," observed Isak. Forsythe Science teacher Dan Ezekiel has helped run the science fair for 25 years and thinks it's a great opportunity to get students involved with hands-on science. "We started talking about the projects before Halloween and go step by step," he explained. "Science projects tie into the sixth-grade curriculum, which is called earth science. Students learn to use the inquiry process to find out how to make their questions testable." Special education students and their teachers collaborated on a giant inflatable whale - one that's so big, tables for projects can fit inside. "I wanted to learn how mood rings work and change color and am using a Slinky with beads on it to represent molecules," she said. Daniel Khain, also a sixth-grader, was inspired by the Dead Sea and the fact that people can sit or lie down on the water. "I took a glass vase and put water and salt and a ball in it and timed how long it took the ball to touch the bottom of the vase," said Daniel. "The more salt or density, the longer it took." Ezekial says that often when he meets working scientists, they tell him about their science project when they were a kid. "Nobody ever fell in love with science because of a quiz," said Ezekial. "It was a project from which they tried to get data and shared with other people that inspired them." That inspiration was part of his past, too. "I did a science project when I was a seventh-grader at Slauson Middle School that was put in the Southeast Michigan Science Fair, where many of our students will have their projects shown," he said. "If I needed to, I could rewrite my report now because I learned what I did for it so thoroughly." His students agree that it's a valuable experience. "Working on a science project is much more interesting and hands on than sitting in class," said sixth-grader Daniel Khain. "I think you learn more because you try to learn more because you are more interested in what you are doing." 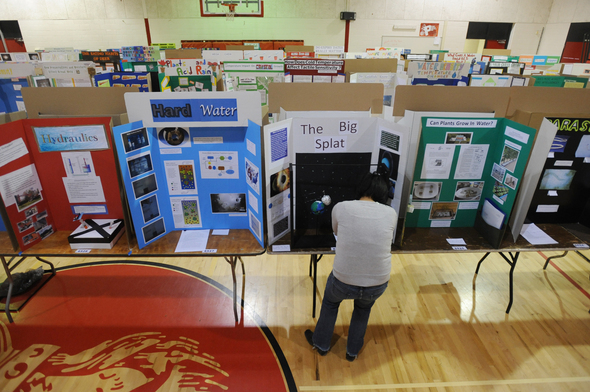 The Forsythe Science Fair open house for the public runs from noon-4 p.m. Sunday with an awards presentation at 2 p.m. Forsythe Middle School is located at 1655 Newport Road. Sun, Feb 12, 2012 : 9:21 p.m. It is an absolute disservice to students to &quot;get them excited&quot; about science. It is a waste of talent as abundantly shown by the large numbers of scientists laid off in this recession. Companies have cut back on investment in R&amp;D. Becoming a scientist means subjecting yourself to high risk of unemployment in a cyclical economy. Meanwhile, business students and entrepreneurs are doing quite well. Let immigrants with poor English language skills fill the technical gap. Real money is made.. closer to the money. Mon, Feb 13, 2012 : 5:28 a.m. Seems to me that a physician is a scientist. Sun, Feb 12, 2012 : 11:16 p.m.
Mike Take a look around! EVERYONE has cut back. With the possible exception of the U of M. Take your opinion and a dime and see if it will get you a cup of coffee! Sun, Feb 12, 2012 : 9:57 p.m. Yes, because we should teach our children to do only what makes lots of money. Sun, Feb 12, 2012 : 5:46 p.m.
Had I known of this even a day earlier, I probably would have been able to make it. Please consider notifying the public sooner than the day of the event (sometimes the reporting doesn't even occur until after the event). I did not have to do a science project in school, but have helped some grade school students with theirs, more as a resource and getting them to think about the different aspects of the topic than doing any of the work for them. Such projects are not only often a great learning experience about the subject matter itself, but also serve as an opportunity to expose the student to the concept of critical thinking. Additionally, it can be one of many occasions to constructively engage with the kids in a fun way! This Forsythe Science Fair looks awesome! The experiments reported in the article (and the answers) were quite interesting to me. For those with an ongoing interest in science, I recently learned of this website: <a href="http://www.science360.gov/files/" rel='nofollow'>http://www.science360.gov/files/</a> . I haven't explored it yet but it looks rich with content. Sun, Feb 12, 2012 : 5:09 p.m.
Hurray for Mr. Ezekiel and all the others who put this together every year!! It is a huge effort and as a former Forsythe parent, I know that the results are just stunning. I know we will be there to see our Grandsons exhibit! Sun, Feb 12, 2012 : 3:12 p.m. This is a great family event. I guarantee you will leave knowing more than when you arrived. These &quot;scientists&quot; are our nation's future. You won't be disappointed. I wish more schools had science fair opportunities for their students. Sun, Feb 12, 2012 : 3:08 p.m. Thanks Dan, It is committed teachers like you who have made Ann Arbor Public Schools as good as they are. Sun, Feb 12, 2012 : 2:55 p.m.
Congratulations Dan! This is just one more example of the magic that dedicated teachers create! Sun, Feb 12, 2012 : 2:46 p.m.
Nice work Dan, and the science staff at Forsythe! I love seeing inspired learning take place! Mon, Feb 13, 2012 : 1 a.m.
Sun, Feb 12, 2012 : 2:03 p.m. I was so mad when we found out our charter school made it mandatory to do a science fair that we did it for her. I hate them, find them very unnecessary to be mandatory. Do it because you want to. So glad ours did not go there. We would have had a fit. Glad to hear what they do, but keep it from being mandatory. Mon, Feb 13, 2012 : 5:33 a.m. I'm not an educator, so I'm certainly not an expert in learning theory. I do have the opinion that this type of project is possibly a student's first taste of 'higher education'. I think this because it is not an 'echo' of a chapter in a text book. Sun, Feb 12, 2012 : 7:44 p.m. This is very sad..... years ago, as a 6-week sub teacher, one of the 6th grade subjects I had to cover was science. I told the students that someone forgot to tell me (and girls in general) growing up how fascinating science could be. I &quot;hated&quot; science even into college, but was blessed with two sons who loved it, one physical science, the other biological science. I learned that there were things that fascinated me! I talked about science with enthusiasm to my sub-class, encouraged the students to expand their thinking and come up with really good questions.... four weeks later during parent/teacher conferences one mom came to me thanking me and said, &quot;I don't know what you told my daughter, but in four weeks time she has gone from hating to loving science.&quot; I find it really sad, that as a parent, you've forgotten to encourage your child to look for the positive in something that may not be YOUR favorite. When your child begins her first job and there's a task she doesn't like...will she call you to do it for her? Very sad. Sun, Feb 12, 2012 : 2:56 p.m.
Sun, Feb 12, 2012 : 2:43 p.m. I am so glad you stood up for your family's beliefs. No child should be subjected to meaningful learning if their parents deem it a waste of time! Bring on the tests and book work? By the way, do you write education policy? Sun, Feb 12, 2012 : 1:02 p.m. I'd love to see market testing shifted into science projects in school. Instead of all of these useless experiments that have already been done or aren't even experiments, have students determine who has the best delivery service, or what lights should be timed for best traffic flow. Which laundry detergents work best or how far you can stand from a car and get the car to unlock. Sun, Feb 12, 2012 : 5:11 p.m.
Another example of the corporatization of education. Blech. Scott you must be a blast at children's birthday parties. Do you do surveys of preference for Bratz® or Barbie® dolls or ask what flavor of frosting tastes better with Coke®? The purpose of this event is to get students interested in science. Let the corporatists do their own research and let the kids do whatever is interesting to them. Sun, Feb 12, 2012 : 2:47 p.m. There were many projects involving market testing, including which paper towel is strongest, which battery lasts longest, which soda is most damaging to teeth, etc. I disagree with the idea that experiments that have been done before are &quot;useless&quot;. The point is they haven't been done before by that student, and many of these experiments are just the right size for middle school students to manage on their own. &quot;Tell me and I will forget, show me and I will remember, let me do it and I will understand&quot;.